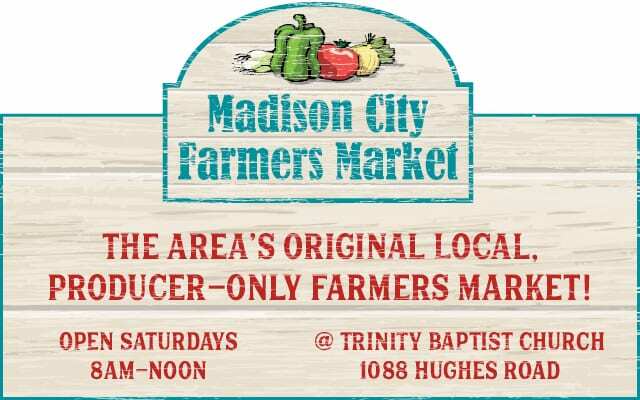 The Madison City Farmers Market (MCFM) is a truly local market, offering only products that are grown or made in the Tennessee Valley. The MCFM is a producer-only market and governed by local farmers and consumers. Everything sold at the market is grown or crafted by local farmers and craftspeople within 100 miles of the market. The market gives priority to farmers and farm products, but also includes hand-made and home-made crafts, products, and foods by local artisans. The market changes from season to season and will expand and contract to allow all that is fresh, local, and plentiful from our farmers. While meats, eggs, cheeses, milk, honey, baked goods and local crafts are available from spring to fall, the seasons bring exciting changes and variety each month. In the Spring the market explodes with fresh strawberries, tender greens, herbs and bedding plants. Summer brings bountiful supplies of tomatoes, berries, peaches, corn, summer squash and watermelons. Transitioning into fall, sweet potatoes, leafy greens, winter squash and pumpkins abound.